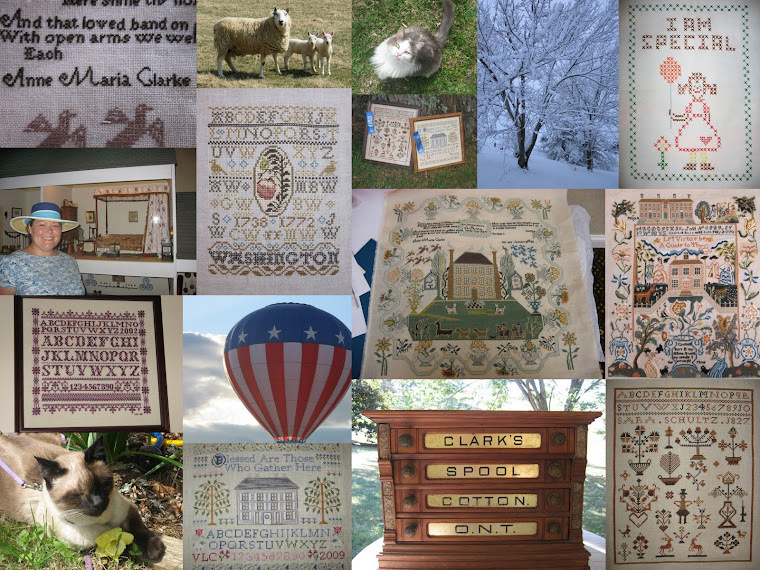 A Shenandoah Sampler: Some Richmond Sampler Progress and Lovely Awards! Some Richmond Sampler Progress and Lovely Awards! I am in the home stretch for my teaching licensure...only a few assignments and two projects to go! I had to video myself student teaching, so I have been suffering through that today. Boy, was it eye-opening...good thing my gym membership is still valid because I will be hitting the gym VERY soon! I have not been around much lately, and I apologize. Many of you have stopped by to say hello and believe me, those little "hellos" have meant the world to me. It is my intention to slowly start to get caught up on all of the wonderful things happening around here that I have missed. I have not been stitching very much, but it has certainly been on my mind. 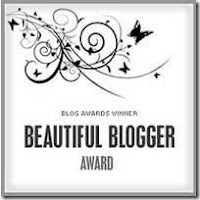 Over the past few weeks, I have been ever so graciously awarded two blogging awards. Unfortunately, due to the craziness of life, I have been unable to treat the awards with the respect they deserve. However, it is high time that I do. I want to thank Sharlotte for nominating me (weeks ago!) 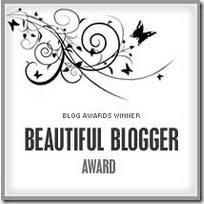 for the Beautiful Blogger Award. Honestly, I was surprised and quite excited when I received word that she nominated me! I felt like I had "arrived" in blogland society! Then, shortly after my nomination by Sharlotte, I received another fabulous blogging award from one of my favorite designers! 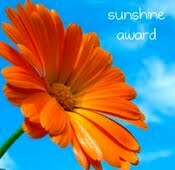 Belinda from Blue Ribbon Designs graciously nominated me for the "Sunshine Blog" Award! Needless to say, I am very honored and grateful. Thank you, Belinda! When I started blogging I simply saw it as an opportunity to share my work with anyone that might be interested. Really, I needed a way to stay motivated. Little did I know that I would meet so many fabulous people! The inspiration that I have received from all of you has been enormous and to think that you all might enjoy reading about me, well, that is just icing on the cake! 7. I used to be the General Manager of a fine dining restaurant. I also managed the 200+ wine list and 1500+ label wine cellar. I was twice awarded the Wine Spectator Magazine Award of Excellence. 6. I did not finish college until I was 32 years old. I was mangaing the aforementioned restaurant full time when I went back to school. It was one of the hardest, most challenging things I have ever done but it is, to this day, I consider it my greatest accomplishment. 5. My husband and I met at the restaurant where I used to work. He was a chef and I was his General Manager. In other words, I was his boss. We dated secretly for 8 months and did not announce our relationship until we were engaged! Our co-workers were shocked! Originally, we thought that my now husband or even I would be forced to find employment elsewhere. However, the owner was so impressed with our ability to keep our relationship professional that he allowed us both to keep our jobs. 6. I love history (it was my college major!) During the summer months I work as a docent at Lee Chapel on the campus of Washington and Lee University. Robert E. Lee (of Civil War fame) was president of Washington College after the Civil War. He built a chapel on the campus and he and his family are buried in the chapel. The chapel is almost like a visit to the Holy Land for Confederate Civil War fans. I am a southerner, but regardless of which side he fought on, Robert E. Lee was an admirable man and I love to be able to share his story with people. 7. I love animals and my husband and I walk the dogs and spend time with the cats at our local SPCA. The dogs should be walked at least twice a day but since the SPCA is so short-handed, it does not always happen. We don't get there everyday, but we do try to get in any time with the animals that we can. Generally, the dogs lead me but I love being able to give them some freedom and attention. The cats just love being petted and brushed. I implore everyone to check out their local shelter and give of their time...the animals will appreciate it! Well, that is about it on the interesting front. I hope that I did not bore everyone! Now, I have to nominate several other blogs, but to be honest, I don't know how to choose! So, over the next few weeks, if I visit your blog and notice that you have not been awarded...look out! You may end up on my nominations! Now on to some stitching! Like I mentioned, the rods are too short but has anyone ever laced the sides of their linen to keep tension there? This is my first time using scroll rods so any ideas or help that anyone could offer would be greatly appreciated. Well, I am off to contiune viewing and editing my teaching video. Great fun. I look forward to visiting the blogs to see what everyone is up to....Happy Stitiching! Great post, Valerie! Love your interesting tidbits about you! Haven't used scroll rods in more years than I can count, so no suggestions on that score! It won't be much longer before you get your license! You could use Stitch Clips to keep your linen tight. Many LNS carry them but here is a link to one just so you know what they look like: http://www.nordicneedle.com/PROD/6934.html I love my linen very tight on my scroll rods and these do the trick. Oh wow! Good luck with the student teaching video! I loved reading the interesting things about you. So cool about you and your husband! And everything else too! Love your Richmond Sampler -- of course! I don't use scroll rods, but I think they have clips of some kind you can use. Congratulations on the awards! What fun to learn more about you. I am a hand stitcher - but I confess I have a gorgeous floor stand and the different size frames to go with it - such a shame that I don't use it (sigh). I just love your Richmond Sampler. Congrats on nearing completion - what a great feeling! I find it much easier to keep tension tight on scroll bars when I use shorter side bars. Try getting a set for your frame that are a 2" shorter and I think you'll see a big difference. Also, once your piece is on longer bars get another set of hands to help you tighten your bars. I always grab hold of the the last bar to tighten with both hands and give it a very hard final roll while my husband tightens the knobs. I've never needed to stitch the sides once I started doing that. Another thing that seems to make a difference is to pad the bars with a piece of cottton quilt batting. Cut the pieces as long as your bars and wide enough to wrap one single time around without overlapping. Place it carefully before you roll your fabric around the bars. I find it much more gentle on stitches when it's padded. Good luck! Oh, and your Richmond sampler is lovely. I can't wait until this fall when it will be offered as an online class and I can start it too! Congratulations on your awards !!! I am a hand stitcher, but lately I've started using a scroll bar lap stand because my hands hurt. It is taking me a while to get used to the scroll bar, though. I do appreciate Stef's tip about the Stitch Clips. I didn't know such things existed !! Congrats on the awards, I enjoyed reading your seven things. Good luck with the student teaching. I think we all get a shock if we ever see ourselves on camera! Your Richmond Sampler is looking good. Best of luck on the video--I wince at still photos of myself, so I can only imagine video--yikes. Yay that you're so close, and I loved reading about you! I'm a q-snap girl; those scroll rod things are a mystery to me. But it's interesting--I don't like my fabric tight, so I loosen the tension on my fabric so that I can "tent" it with my hand as I stitch. Good luck with your video! I would have a hard time with that because I can't stand even having my picture taken, let alone watching a video of myself. Loved reading all the great things about you. Your Richmond Sampler is looking wonderful so far. I use those Stitch Clips too for the sides. Seems that the bigger the piece you have on scroll rods, there is more of a tendency for the sides to sag a little. Those clips really do the trick! I find that the sides get worse as I have more stitched and start to roll it up, because the stitched part is fatter than the unstitched sides. To solve this I cut strips of thin cotton quilt batting the width of the side margins and place them on my linen so that they "bulk up" the sides, giving me nice tight tension. I finally have some queen stitches in on Richmond - one of these days I'll find the time to take a picture and update my blog. Sounds like you are in the home stretch with receiving your teaching certificate. That is great! Richmond Sampler looks wonderful. I don't have any advice for you on the scroll frames. I mostly stitch in hand and occasionally use qsnaps. Good for you on all your school work. Hang in there! Your Richmond Sampler looks great. I don't use rods or frames so can't offer advice. I was going to say to ask Deb but saw that she answered so hopefully that might help. I enjoyed reading about you! Bless you for walking the dogs and spending time with the cats at the SPCA. I admire your ability to not come home with thousands of animals--it must be hard. I also enjoyed reading about your being a docent. It sounds like a place to check out! I loooove history.